New for 2019, our exciting Winter Camps allow us to to provide our outstanding in-school residentials throughout the school year. Our 23 hour Winter Camps are available from December to March. We deliver our accredited educational activities in our cosy canvas bell tents and run activities involving all of our campers - like that all-important campfire! - in our giant eight metre tent. We heat all of our tents with traditional wood-burning stoves and take advantage of your school buildings to allow the children to “camp” inside the school, as well as using your school hall for some of our larger and more energetic activities. The Outdoors People are committed to getting as many children as possible involved in adventure education. Our Winter Camps start at just £34 per person with no hidden charges. Visit our School Camp Prices page for more information. Just like our popular summer camps, we take our flag raising ceremony and the mighty Kin Ball to every school. The evening is time for songs, stories, and hot chocolate around a blazing stove in our giant eight metre tent! The opening ceremony includes raising the decorated camp flag! Every school receives their blank flag around two months before their camp. The children decorate their flag ready to raise high above their camp during the opening ceremony. In poor weather, we can even raise the flag in our giant eight metre tent! Many schools go on to make their flag part of a wall display. The evening is time to burn off some energy and let the children battle with the mighty Kin Ball in our giant games - all delivered in the warmth of your school hall. Songs, stories and hot chocolate! A critical element on any camp is the campfire! On our winter camps, we heat hot chocolate with marshmallows on our wood-burning stove, sing the loudest songs we can sing, and, finally, tell interactive stories by flickering firelight before bed! During the day, our schools choose four educational activities from our growing range. We run our activities in in our heated tents or inside the school building. All of our activities are delivered by our highly trained and experienced staff. To view a sample programme, click here. Our main aim was for children to have a sense of team building and to learn to experience a variety of different scenarios. They got so much out of the sessions! Delivered in one of our giant, heated outside tents this is one of our core bushcraft activities. Highly popular with teachers, children, and the camera person! Firelighting: using a sparking fire-steel, everyone will set cotton-wool ablaze! Self-sufficiency and life-skills by working together to follow our easy-to-learn giant pancake recipe and then do the washing up! Run in your school hall or a similar large inside space, Life Skills and Team Building uses mobile and engaging activities to foster co-operation, communication and initiative. Our unique and stand-out life skills challenges will stretch and develop every team. A core bushcraft activity that we deliver inside one of our giant heated outside tents. The children work in pairs to build a purifying filter able to take on the muddiest water The Outdoors People can make! Get it right and you'll get to make some of the tastiest hot chocolate you'll ever drink. In the winter, we move this fascinating activity into a classroom or similar space in your school. Using ancient tools, students will learn how to drill their own personalised stone Survival Pendant and braid a cord for it that doubles as a useful tool in emergencies! 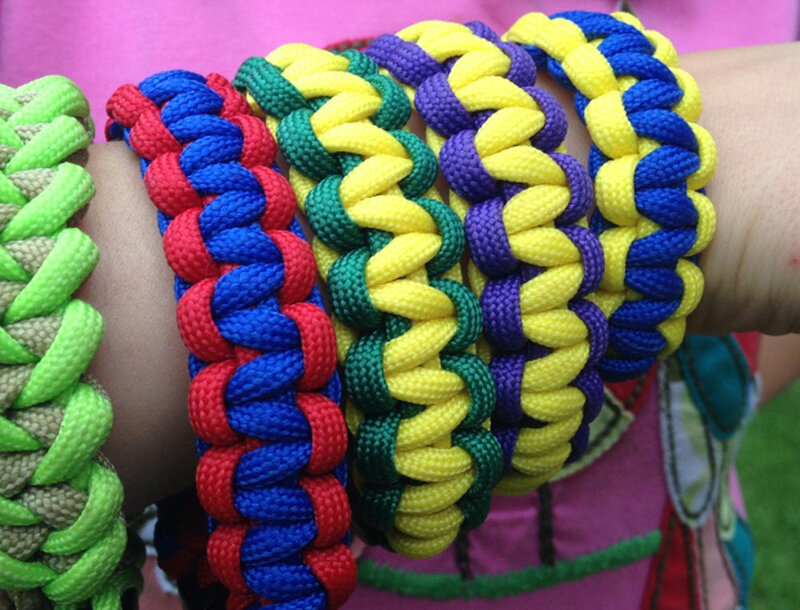 Delivered in a classroom or similarly sized indoors space, the children learn to weave a versatile survival bracelet to take home! Don’t see the activity you’re looking for? Our Summer Camp programmes include many more options! Click here for more information. At the end of the camp, the children launch water rockets to summon a rescue from their survival experience, and round out their camp by reviewing their amazing adventure before lowering their camp flag.